The Joint Admissions and Matriculation Board, JAMB has debunked claims that snake swallowed N36 million in its office in Benue State, saying it was a case of criminality and fraud carried out by one of its staff. Stories have gone viral on the internet claiming that snake swallowed N36 million at JAMB office in Makurdi, Benue State. 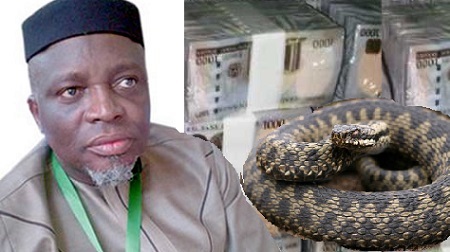 A statement issued by JAMB on Monday by its spokesperson, Franklin Benjamin said it was a pure case of criminality and fraud by one of its staff and that there was no snake anywhere to have swallowed the money. He said a sales clerk, Philomina Chieshe, told JAMB registrar and his team that she could not account for N36 million she made in previous years before the abolition of scratch cards. He said in the course of interrogation, Philomena denied the allegations that she stole the money but confessed that her housemaid connived with another JAMB staff, Joan Asen, to “spiritually” (through a snake) steal the money from the vault in the account office. Benjamin said “It is natural for the office to account for what they have after the sale of scratch cards has been stopped and we discovered that lots of money was missing in Markurdi and other offices. “There are procedures in the civil service, so the whole thing is still under investigation. She was queried, she appeared before disciplinary committee, although she confessed that money was missing and a snake swallowed it. “Unfortunately, she is calling one Joan’s name which did not appear in the investigation at all. Joan only recommended a house help for her. Of course, the management did not believe the story. She is just trying to put an excuse forward. “These are things the Registrar is trying to unravel to put the board on the right footing. We had a case where one of the staff said he had an accident on his way and the scratch cards got burnt but only for us to discover that they were used because they all had serial numbers,” he said.